Included are 13 different, mostly elaborate outline designs. Some are in original size, some will need to be enlarged. 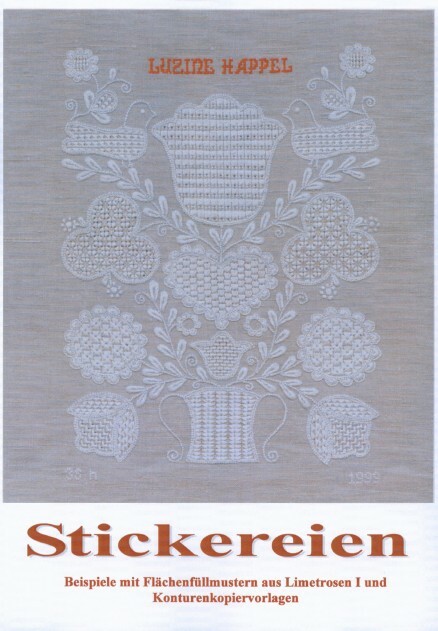 There are 2 wreaths; 2 centre motifs for oval table runners; 1 edge motif for an oval table runner; 1 edge motif for an oval doily; 1 centre motif for a round doily with an elaborate hem; 4 different motifs, which may be arranged into a circle, an oval or a band; and 2 closely filled rectangular designs for pillows or bags. For each design, a finished piece is show in its original size. All the finished examples used filling patterns from “Limetrosen I”. Also, the book includes particulars such as the finished size, the linen used, the quantity of the threads used, the filling patterns used and sometimes also the hems of each piece. One can look into the book in “shop“.